The Maine of Sara Majka is just as haunted as the Maine of Stephen King. There are doppelgangers and secret passageways, mysterious paintings that should not exist. People go missing, of their own volition or otherwise. Whole islands are known to disappear from the surface of the sea, leaving only scattered rocks in their place. But the true malevolence of Majka’s world—the thing that traps her characters in a state of lifelong discontent—most often manifests in mundane hauntings: regret and remorse, vanished love and vanished youth, feelings of dislocation and the inability to belong. 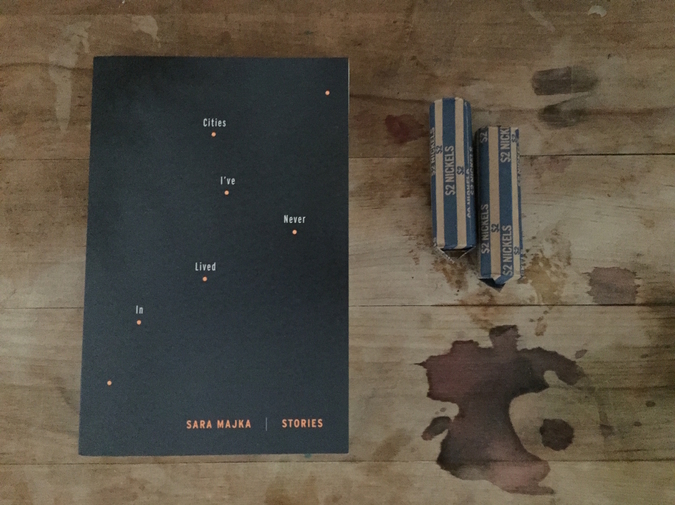 In a melancholic prose sometimes reminiscent of other quietly apocalyptic writers—Kundera, Markson, Sebald—CITIES I’VE NEVER LIVED IN drifts from story to story, from legend to anecdote, forever seeking a New England now lost (and perhaps only ever imagined). Our guide throughout is Anne, a woman divorced for the last decade and unmoored from any stable sort of life. She travels with her memories around Maine, to Provincetown and New York, to the industrial cities of the American Midwest, driven not so much by what she might find as by the fear of what she will do if she ever stops moving. Upon finishing the book (released earlier this year from Graywolf Press), I very much wanted to go to Maine, though I suspect that the Maine I now wish to visit is not one that I will ever actually find. (This gives me something in common with the book’s characters.) Thankfully, Sara Majka was kind enough to answer some of my questions via email. She’s currently based in Queens (though not for long), where she is a new mother in addition to being a new author, and is still grappling with life’s mundane hauntings. How old are the stories in this collection, and how many stories were there before the ones in this collection? This is your first book, but your voice has this sort of existential weariness to it, and I’m curious if that has always been your voice or if it’s something you grew into. It reminds me a bit of W. G. Sebald, who I know you’ve read. Who I love. Who everybody loves, I think. But with Sebald, I always assumed it came from the fatigue of age, and living abroad, and his post-war German baggage and all that. Things that wouldn’t seem to apply to you. But you have this natural, digressive, fatalistic way of telling a story that I find very captivating. Has that always been the case? Some of the stories go quite far back, probably eight or ten years, while a few I wrote after the manuscript was accepted. I have been writing, or trying to write, stories for much of my life, so there were a lot of stories before these, but those ones were not good enough. I would say that weariness I grew into, was probably what the stories needed in order to be better. Sometimes I run across a young writer who has quite a lot of talent, but the subject matter and urgency aren’t there for them yet, and I’ll think to myself, perhaps their life will fall apart. I can see that being taken the wrong way, that I’m saying your life needs to be in shambles to be a good writer, which isn’t what I mean. But I think it does help if the surface is cracked a little bit, if that makes any sense. Which is a long-winded way of saying that I went through struggles, which had some good effects on the writing and some not so good effects, but you can’t fake weariness I don’t think. I tried writing a story directly about that—about feeling such fatigue at an age that was too young for it, and trying to make sense of where it came from, but the story didn’t go anywhere. I kept thinking to myself, maybe this is a fancy way of describing depression, but it felt different than that to me. I read in your interview with Becca Worby at Electric Literature that you wrote the last two stories to intentionally make the collection feel more linked. Which they do, certainly, particularly the final one, and I enjoyed that, how the interconnectivity isn’t really explicit until the end of the book. I’m interested in the linked collection as a genre (outside of the idea that it’s more marketable than an unlinked collection). Do you think a linked collection has more to offer than a collection of unrelated stories? Or do you think the concept of a linked collection isn’t terribly useful, and that if the stories are able to stand alone we shouldn’t require anything else from them? It wasn’t quite that way…perhaps my description of it was confusing in the Electric Lit interview. I resisted linking the collection because I was afraid that I would force material that wasn’t meant to be linked…so it wasn’t until the end that I admitted they were meant to be linked. Once the collection was “linked” (which pretty much involved changing a few names and trying to be a bit more aware of timeline), then the last two stories just happened, just came together quickly, as it was clear there were a few more things I wanted to say about the narrator. I—of course—dislike the term. Who actually likes it? Would one promote Jesus' Son as a linked collection? Perhaps they do. The term starts to break down in meaning once you try to figure out which collections are linked and which aren’t linked. I do like collections that are of a piece, or of a mood, that culminate in some way. I like feeling they came out of a particular time and place or mood in a writer's life, rather than simply a gathering of stories. I like to see a writer at work over that long of a span—the span of a book—sometimes more (sometimes much more) than to simply read an excellent story. Ah, I understand now. That’s interesting. I agree that the term “linked collection” isn’t a great one, though I do really like that sort of collection—and it sounds like you do, too— because it can get at something larger, thematically, in a different way than a novel can. I guess when I say linked I’m thinking of shared characters, shared localities. A shared universe, as opposed to just a set of stories interested in similar things. I think it would be nice if we had a better term for it. Because I do think we lose great story collections to the novel genre, in part because we don’t have a better way of classifying them. Jesus’ Son is a great example. I've heard a lot of people refer to it as a novel. The Emigrants and The Things They Carried, too. Some linked collections—A Visit from the Goon Squad by Jennifer Egan, The Imperfectionists by Tom Rachman—literally have “novel” written on the cover in the hopes that they’ll sell better. And they do sell better, and people read them and enjoy them without ever thinking about how they’re composed of discrete short stories. Which is a bit sad, I think. For the short story as a medium. For short story writers who are told their work can’t sell. But maybe I’m setting up a zero-sum game between novels and short story collections that doesn’t actually exist. Do you think distinctions like that matter, at the end of the day? How do you see Jesus’ Son? Your narrator is looking for a copy of it in the title story of your collection, and she shares a few similarities with Johnson’s narrator(s), in that she’s in a period of transience, moving among the people at the bottom of society. I was wondering what your relationship to that book is. I do make a distinction similar, I think, to what you’re making. For instance, Junot Diaz’s Oscar Wao to me was a linked collection that pushed itself into a novel, and I felt I could see the effort in that push, whereby Drown was a collection and didn’t have to do any extra pushing, and there was, to me, more elegance in Drown. Something elegant and moving and simple missing in Oscar Wao. But it’s been a long time since I read Oscar Wao, so this is going on memory here. It’s possible I’m getting it wrong. Jesus’ Son I could only think of as stories. They are stories. I would, I think, get frustrated with someone who tried to argue otherwise. I really love that book. You know, he was a fellow at the Provincetown Fine Arts Work Center. I seem to recall someone saying that he stayed in Provincetown for some time afterward, that someone gave him a place to stay, and that was how he finished his first book. Yeah, I believe one of his novels, Resuscitation of a Hanged Man, is actually set in Provincetown. It’s in my pile of books I’m planning to read up there. Before you went to Provincetown as a fellow, you had already spent a lot of time in the Cape Cod region, right? I read that you’ve lived, at various times, on Martha’s Vineyard, Nantucket, and the Elizabeth Islands. Did those places have a direct influence on your stories? Much of the book takes place in Maine, and I know you’ve spent time there as well, and I would imagine that Maine has a pretty different vibe than Massachusetts. But islands come up a lot in the book: their remoteness, their inaccessibility. Do you think islands and coastlines and a proximity to water have shaped you as a writer? Yes, my dad was a dentist for the Coast Guard. When I was older, we moved every few years, but when I was quite young, we moved a lot—to remote coastal places in New England that didn’t have a regular dentist. I once had them pull out pictures of each house we lived in and write a description of them. I was so young that I didn’t really remember the houses, but I always had the sense that it affected me—I just wasn’t sure why or how. I would have to call it probably my primary influence as a writer, that and the books I read growing up. Living in New York I missed it, especially when I was pregnant for some reason. I would go online and try to find beaches that wouldn’t involve horrible, all day transit to get to, and I would drag myself there—to Long Beach, to Rockaway—and I hated it, but at least it was water. One day, in the middle of trying to get to Long Beach, the Long Island Railway route that I was on shut down, and it was so hot and I was pregnant trying to explain to an employee how much I needed to get to the ocean. Oh, wow. That’s a funny image, but I can imagine your frustration. I thought it was so interesting that, in the title story, you have your narrator, who for most of the book is based in coastal New England, go on this voyage. But it isn’t out to sea, it’s into the American interior, to the rusty, bus-connected cities of the Midwest. Which is almost like a modern equivalent of Ishmael or someone like that going to sea, which wouldn’t have been as romantic an idea back then as it seems now. And the bus trip, to cities like Buffalo and Kansas City and Memphis, sleeping in hostels and eating in soup kitchens, probably doesn’t sound romantic at all to modern readers. But this is based on something you really did, right? Did you do it for the same reasons the narrator describes, wanting to sort of be adrift for awhile? And was that an unusual venture for you, or have you often made sort of impulsive, conceptual trips like that? Ha, ha, I am anything but impulsive. I love a good bargain, so I bought those bus tickets from Megabus the day they went on sale. If you’re the first person to buy them, they cost a dollar, so I am that person who actually pays a dollar for Megabus tickets. I bought, like, fifteen of them. Seriously though, I’ve tried to do a lot on not very much money, so that kind of planning becomes necessary. I’m not answering your question very well, but as we speak I’m surrounded by bills and debris of accounting. I just became a landlord and am trying to make heads or tails out of it, and my mind is on numbers and not romance at all. But yes, a fair bit of planning goes into those trips, but I do take those sorts of conceptual trips often…maybe abstract is a better word, as conceptual sounds loftier than I mean it to be. I feel drawn to something abstract that I can’t put a finger on and I try to trust it and move towards it. That trip to the interior cities I actually did and for the most part that story is non-fiction. It’s the only one in the collection like that—I didn’t write it intending for it to go with the others, but then I thought that it fit in the book. That’s interesting what you said about how going to those cities might have been similar to going out to sea way back when. I didn’t think about it that way, but it’s probably true. The coastline is now a relatively rarefied place—the world isn’t there anymore. The bargains, the bills: that’s all actually reflective of something I noticed about the book, which is how the economic circumstances of the characters are always present on the page. And not just in the descriptions of depressed towns or islands. There’s a lot of stuff about family budgets, people thinking through how they can pay for housing and childcare and food. Part of the narrator’s quest seems to be trying to find ways to exist in the world cheaply. Happy hours, discount beer. There are many, many trips to thrift stores. Those things are such a constant, almost overwhelming, aspect of life, and they often get downplayed in literature, it seems. In a recent review of Rumaan Alam’s new novel for the Rumpus, Jason Arthur was bemoaning how much of contemporary literary fiction is about wealthy characters: “It’s not just beach novels that have lately softened in this way toward the 1%. Even recent potential national award finalists are asking us to stop worrying about inequality and love the rich: Sari Wilson’s Girl Through Glass, Edmund White’s Our Young Man, and Ramona Ausubel’s Sons and Daughters of Ease and Plenty assume easy identification with the accoutrement of affluence, of membership in such suspect institutions as Balanchine ballet, supermodeling, sailing, and/or summering.” Which seems weird to me, since all the writers I know are broke (and most of the non-writers are as well). Do you think there’s a social or artistic responsibility to be more reflective of the fact that most people are basically living paycheck to paycheck, or is it more that you just write from your own experience and that experience involves a lot of thrift stores? I think it’s two things, that it’s personal and also how I see the world. I spend a lot of time thinking about how to survive. I’m a single mom now, and, you know…I’ve done the hard stuff. I waitressed seven months pregnant. I’ve argued my way through the New York City safety net programs. But it’s also strange to be poor and not poor at the same time…because I was raised middle class and have resources and education…hmmm…all the other questions you asked I could answer quite quickly, but this one…I keep rewording to try to say it right. It’s a difficult thing to talk about. Since the book came out, I’ve found myself invited to do panels, and because survival is so key in my mind, I keep bringing up money issues at panels and people seem glad that someone is talking about it. I think saying that we have an obligation to write about the poor is a way to welcome some bad writing. It has to come from inside you, whatever it is you write about. Which I’m sure you know. For some reason—and I am never going to be able to find the right words for this—there’s an emotional connection for me to it. I wander around the streets and gravitate towards poverty, towards the hardness in other people’s life. Something in me just seems to want to understand this about the world. Do you think there’s a religious aspect to your emotional connection to poverty? Or the echo of religion? In the story “Travelers,” the narrator and her husband are living in apartments next to a church, and the narrator attends services there despite not being a believer. She says she does it for the “neighborliness of the event,” though that sounds like a bit of a simplification of her motives. But so much of religion is based in being among the poor, loving the poor, servicing the poor. At least in theory. Yes, I do. I think there is a religious aspect, though I think I would get into even stickier territory talking about that. I will say that I have volunteered for periods of time at two soup kitchens and both were run by churches, and then I have eaten at different soup kitchens and they were usually run by churches. It’s something that doesn’t get talked about often enough, how much churches have to fill in the safety net for the poor in this country. When I was planning my trip to the interior cities, I was volunteering at a soup kitchen in Brooklyn and I talked to the pastor about it. I forget the language she used, but she expressed an understanding of it in terms of religion. While it is perhaps a difficult trip to explain, I don’t think it is unusual historically in that community, if that makes any sense at all. When I first thought about your question, I tried to imagine writing a story about a well off—or at least comfortable—person considering spirituality, and I couldn’t imagine writing that story. I don’t know why it has to be a poor person for me to write it. Something in how you’re stripped down when you’re poor—there’s no padding around your life. Would you say that you’ve prioritized writing in your life over other things? What I mean is: some people seem to stumble into writing books, while for other people it seems like their lives are lived completely in the service of the books they are writing or will one day write. Do you think you’ve been self-consciously leading a writer’s life, or have you just been living a life that happened to result in a book? Or maybe that’s a false distinction? I grew up reading, and loving that sort of life, but to say that I prioritized writing over other things would make me feel like I should have written a lot more. I mean…a lot more. But still, I suppose I set up my life in an attempt to be able to keep imagination, to not lose that. Are you attracted at all to the idea of writing memoir or personal essays? It’s become such a popular genre (with Graywolf being one of its principal purveyors), that it seems like a lot of people who might have once written autobiographical fiction are now writing creative nonfiction. I’ve read in interviews that you’ve said this book isn’t actually all that autobiographical, and yet it does, I think, feel very intimate and confessional for the reader. I feel pretty confused right now about what I want to do. I would like to write about having a baby, but I don’t think I could do that as a fiction, but it would be difficult to give up that secret space you create when writing fiction. I really don’t know what I want to do about it and I’m putting off writing because I don’t have an answer. Between the baby and the book, I’d imagine you’re having a pretty landmark year. Like, I’d bet that, in the future, this will be one of those years that you look back on as being a dividing point between different phases of your life. Do you think that your motivation has changed from what it was a year ago, two years ago? Do books still feel as important as they did before? I’m also in the middle of a move from Queens to Providence, RI, where through much hard work—many years of working towards it—I seem to have concocted a long term financial stability plan. But that’s back to finances! And then also the subject about the cost of living in New York, which is well traveled territory. I actually found it quite doable if you were able to do the hustle, but once I had the baby I couldn’t work like that anymore. And then, also, your New York experience starts to become a Frankenstein experience, at least it did for me. You make so many patches out of need that it no longer resembles anything that you would have chosen at first. I could talk about New York for forever. It is so much easier to talk about than my own writing. I think I am waiting for the dust to settle a little from this year to see where I’m at. Books seem essential for that, for getting back to myself, for finding that space again.